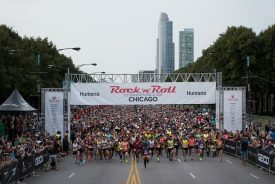 CHICAGO, IL – July 14, 2017 – The Humana Rock ‘n’ Roll Chicago Half Marathon returns this weekend with more than 18,000 runners from all 50 states and 29 countries set to take over the Windy City. The running begins on Saturday with a 5K in Grant Park followed by the half marathon and 10K through downtown highlighting some iconic Chi-town areas– the Loop, the Magnificent Mile and the picturesque lakefront. Fifty years ago, Kathrine Switzer, became the first woman to complete the Boston Marathon starting the fight to overcome gender stereotypes. Her foundation, 261 Fearless – named after the original bib number she ran with — supports women in the sport of running and is one of the featured charities of the weekend. Through her partnership with Humana, the 70-year-old is now focused on inspiring seniors to achieve their best health and experience all life has to offer. As part of the festivities, Switzer will be taking part in the 5K and will be around to cheer on runners in the half marathon and 10K. “One of the reasons I’m involved with Humana and Rock ‘n’ Roll [Marathon Series] is that if we can show older runners that our sport can be engaging, social, and fun, we can keep them at it,” Switzer says. “I’m trying to be a good example. I’m approaching this 5K as a fun event, one that is accessible to anyone, at any age. Defending champion, Neely Spence Gracey, returns to Chicago looking for her second straight win on this course. Expected to compete against Gracey will be Chicago’s own Kristina Aubert, an Olympic Trial qualifier in 2016, and St. Louis’s, Julia Kohnen, the current course record holder of the Champaign Illinois Half Marathon. For the men, Tyler Pence of Springfield, Ill., is a top favorite having won the Rock ‘n’ Roll St. Louis Half Marathon in 2016. Scott Dahlberg of Fort Collins, Colo. and local runner Daniel Glaz will look to challenge Pence both posting personal bests of under 1:10:00 in their careers. Race weekend kicks off with the Health & Fitness Expo at McCormick Place on Friday and Saturday where runners can pick up their race packets and try out the latest in running gear, nutrition, and training tips. The half marathon and 10K will start in Grant Park on Columbus Drive and Monroe Street. The fast and scenic course gives runners a first-class tour of downtown with epic views of the Chicago skyline, Lake Michigan, Chicago River and more. In true Rock ‘n’ Roll fashion, runners will experience the sounds of live, local bands, along with enthusiastic cheerleaders to keep them moving. Once crossing the finish line, they can celebrate with the Toyota Rock ‘n’ Roll Concert Series featuring the New Orleans jazz group, Dirty Dozen Brass Band as the headliner act. For more information, visit RunRocknRoll.com/Chicago.